Just one of the fallen French Resistance Internationalist Trotskyists Comrades: Yves Bodénes, built a cell in Kerhuon near Brest, later head of the clandestine organization of Finistère Trotskyist; arrested by the Gestapo in October 1943 and killed at Camp Dora March 11, 1944. Source: Spartacist , New York, Winter, 1979, Volume VII, No. 1 pages. 22-28. Public Domain: Encyclopedia of Trotskism On-Line, 2006. You can freely copy, distribute, display and perform this work; as well as make derivative and commercial works. Please credit the Marxists Internet Archive as your source, include the address of this work, and note the transcribers & proofreaders above. It is with great satisfaction that we publish for the first time in English this moving and historically important document. The “Declaration of the Internationalist Communists of Buchenwald” is a programmatic manifesto by cadres and sympathizers of the Trotskyist movement who survived the Nazi concentration camp. Neither fascist torture nor Stalinist persecution broke these comrades’ political courage. Originally written in German, the declaration was issued a little more than a week after Buchenwald was liberated in April 1945. Its third section was printed in a 1946 issue of Neuer Spartakus,the first German-language Trotskyist press published after the war. This part of the document was reprinted in October 1974 in Die Internationale,journal of the West German Pabloists. More recently, two different French translations of the full text have been published. One appeared in the Bulletin(No. 10) of the Centre d’Etudes et de Recherches sur les Mouvements Trotskyste et Révolutionnaires Internationaux (CERMTRI); the second in Critique Communiste(No. 25, November 1978), journal of the French Pabloists. Our translation is from the original German text, which was obtained from the CERMTRI archives in Paris. This introduction is largely based on the prefaces to the text which appeared in the CERMTRI Bulletinand Critique Communiste. The “Declaration of the Internationalist Communists of Buchenwald” was the collaborative work of four comrades: the two Austrians Ernst Federn and Karl Fischer, Marcel Beaufrère and Florent Galloy, French and Belgian Trotskyists respectively. Like many other German and Austrian Trotskyists, Federn and Fischer were seized by the Nazis even before the outbreak of the second imperialist war. Both were first arrested for their revolutionary activities in Austria in 1935. Federn was released but Fischer and other Austrian Trotskyists were imprisoned and tried in Vienna in 1937. Sentenced to five years’ imprisonment, they were released in the amnesty decreed on the eve of the German annexation of Austria in February 1938 and escaped to Belgium and later to France. Federn was arrested again in 1938, sent to the Nazi camp at Dachau and later moved to Buchenwald. Many of the Trotskyist cadres who were to join Federn at Buchenwald spent the first years of the war clandestinely organizing among German workers and soldiers under the Nazi occupation. Their internationalist struggle made the scattered Trotskyist cells the target of not only the Gestapo but also the Stalinists. 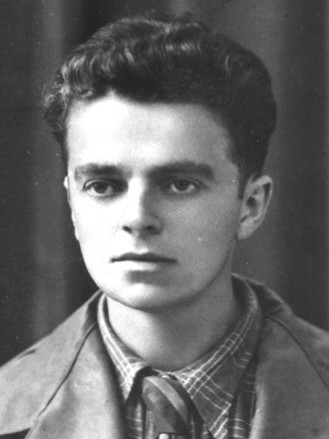 Marcel Beaufrère was typical of those Trotskyist militants whose clandestine work was punished by the Nazis with imprisonment in the death camps. In and out of prison since 1939, when he had first been arrested for “provoking disobedience in the army,” Beaufrère worked closely with Marcel Hic, who had succeeded in regularly publishing La Véritéright under the Nazis’ noses. 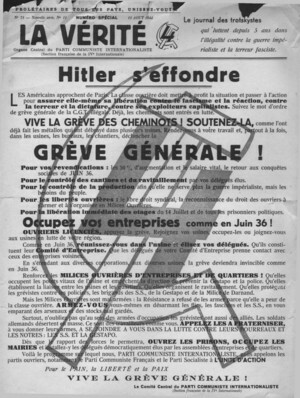 In September 1943 Beaufrère was assigned to head up the Trotskyist cell in Brittany, where the underground paper Arbeiter und Soldatwas printed and distributed among the German armed forces. Despite fierce repression (in October 1943 the Gestapo caught and shot some 65 members of the cell, including 30 German soldiers and sailors), Trotskyist propaganda in German continued to be produced in great quantity (with press runs as high as 10,000 copies) and disseminated as late as August 1944. Beaufrère was finally arrested in October 1943, tortured and then sent to Buchenwald. And Abram Leon, gifted author of the still definitive Marxist work on the Jewish question and leader of the Belgian Trotskyist cell in the Wehrmacht, was arrested in June 1944 when he arrived in the Charleroi region to assume control of the clandestine work among the miners, which covered some 15 mines and included publication of Le Réveil des Mineurs.Tortured by the Gestapo, Leon was exterminated in a gas chamber at Auschwitz at the age of 26. Despite the Nazi terror, the Trotskyists in the concentration camps sought to continue fighting for their revolutionary program. Several accounts testify to the heroism and courage of the Trotskyist cell at Buchenwald. According to an interview which Beaufrère gave to an iSt representative in January 1979, when the Nazis were preparing to abandon Buchenwald to the approaching Allied forces, the camp commandants broadcast over the loudspeaker system an order for the prisoners to assemble. Recognizing that a final round-up and execution of the Jewish inmates were very likely in the offing. Beaufrère and his comrades immediately began to urge the inmates not to report for the assembly and to get the political prisoners to give their identifying red emblems to the Jews, who were forced to wear yellow stars on their uniforms. An almost certain mass slaughter of Jews (and perhaps communists as well) was thus partially averted. The political authority which the Internationalist Communists earned within the camp played no small role in their survival. As was the case at other Nazi camps, at Buchenwald the Trotskyists lived under the constant threat of assassination by the Stalinists, who in most cases controlled the clandestine military apparatuses formed in some camps. According to the interview with Beaufrère, the French Stalinist cell at Buchenwald recognized him as a Trotskyist upon his arrival in January 1944 and vowed to kill him. Elsewhere, Trotskyists were indeed murdered by the Stalinists—for example, Pietro Tresso (Blasco), a leader of the clandestine Trotskyist organization (the PCI), “disappeared” after a Stalinist-organized raid freed some 80 resistance fighters from Puy, a Nazi camp in France. At Buchenwald the French Stalinists used their administrative positions as trustees to assign Beaufrère to a task that would almost certainly lead to his death. Beaufrère was saved from this “death warrant” by the active solidarity of the German and Czech Stalinist cells, eventually also gaining the support of the other cells (which were organized along national lines), including the Russian group. The Buchenwald declaration is not without its weaknesses. From the standpoint of Trotskyism the manifesto contains formulations on the questions of the USSR and the Fourth International that are fuzzy if not simply ambiguous. Thus, while the Soviet bureaucracy is referred to as a caste, the declaration avoids characterizing the USSR as a degenerated workers state. It quite explicitly puts a question mark over the future evolution of the regime and nowhere calls for the unconditional military defense of the USSR. Likewise, while “IV International” appears at the end of the document in parentheses, the Fourth International and Trotskyism are not mentioned in the text. Rather, the declaration states that “a new world revolutionary party” remains to be created. These were not hasty formulations but the result of much discussion. Beaufrère and Fischer held widely divergent positions on the class character of the USSR and on the Fourth International. Even before the war, Fischer had adopted a “state capitalism” analysis of the USSR and his group had grown increasingly aloof from the Fourth International. The Buchenwald declaration represented a compromise. Karl Fisher explained in a 29 May 1946 letter to his comrades in Paris. It should also be noted that the Declaration rather categorically predicts the imminent eruption of major inter-imperialist rivalry between the U.S. and Britain. Such a projection, of course, was very soon revealed to be false. However, the issues involved were not new; in the mid-1920’s Trotsky already analyzed the bases for future Anglo-American inter-imperialist rivalries. But at the close of World War II the U.S. was clearly emerging as the hegemonic imperialist power. Even with these weaknesses, the Buchenwald declaration on balance is a principled and powerful statement of revolutionary internationalism, an affirmation of revolutionary optimism in the capacity of the communist vanguard to lead the resurgent proletariat out of its crisis of leadership and toward the conquest of power. In the wake of the second imperialist war Italy, Germany and Japan have lost their stature as great imperialist powers, while that of France has been severely undermined. The imperialist antagonisms and conflicts between the USA and Great Britain dominate the conjuncture of world imperialist politics. At the beginning of this world war Russia emerged from its isolation and today confronts the task of politically and economically consolidating its military successes in opposition to the appetites of the victorious imperialist powers. Despite its enormous efforts China remains a pawn of the great imperialist powers, an inevitable consequence of the victory of the Chinese bourgeoisie over the Chinese proletariat. The unanimity so ostentatiously displayed at the international imperialist peace conferences is intended to dupe the masses by concealing the antagonisms inherent among the capitalist powers. However, coinciding military interests vis-a-vis Germany cannot prevent the explosion of the antagonisms in the Allied camp. To these antagonisms must be added the inevitable crises and the social tumult of the decaying capitalist mode of production. A precise analysis of the international situation using the methods of Marxism-Leninism is the indispensable precondition for a successful revolutionary line. This development renders it possible for the German proletariat to rapidly recover from its profound defeat and to again place itself at the head of the European working class in the battle for the overthrow of capitalism. Isolated by the failure of the revolution in Europe, the Russian revolution has taken a course which has led it further and further away from the interests of the European and international proletariat. The policy of “socialism in one country,” at first just a defense of the interests of the ruling bureaucratic clique, today leads the Russian state to carry out a nationalistic policy shoulder to shoulder with the imperialist powers. Whatever the course of events in Russia may be, the international proletariat must cast off all illusions regarding this state and with the aid of a clear Marxist analysis realize that the presently ruling bureaucratic and military caste defends exclusively its own interests and that the international revolution cannot count on any support from this government. The total military, political and economic collapse of the German bourgeoisie opens the road to liberation for the German proletariat. To prevent the restabilization of the German bourgeoisie, facilitated by imperialist antagonisms, and to establish workers power, the revolutionary struggle of the working class of each country against its own bourgeoisie is necessary. The working class was deprived of its revolutionary leadership by the politics of the two international workers organizations, which actively fought and sabotaged the proletarian revolution that alone could have prevented this war. The Second International is a tool of the bourgeoisie. Since the death of Lenin the Third International has been transformed into an agency of the foreign policy of the Russian bureaucracy. Both Internationals actively participated in the preparation and prosecution of this imperialist war and therefore share responsibility for it. To attribute responsibility, or partial responsibility, for this war to the German and international working class is only another way of continuing to serve the bourgeoisie. The proletariat can fulfill its historic task only under the leadership of a new world revolutionary party. The creation of this party is the most pressing task of the most advanced sections of the working class. International revolutionary cadres have already come together to construct this world party in the struggle against capitalism and its reformist and Stalinist agents. In order to carry out this difficult task there must be no avoiding the issue through the more conciliatory slogan of a new 2-1/2 International. Such an intermediary formation would prevent the necessary ideological clarification and would sap revolutionary will. III. Never Again a 9 November 1918! In the imminent pre-revolutionary period what is necessary is to mobilize the working masses in the struggle against the bourgeoisie and to prepare the construction of a new revolutionary International that will forge the unity of the working class in revolutionary action. All theories and illusions about a “peoples state” or a “peoples democracy” have led the working class to the bloodiest defeats in the course of class struggle in capitalist society. Only irreconcilable struggle against the capitalist state—up to and including its destruction and the construction of the state of workers and peasants councils—can prevent similar new defeats. The bourgeoisie and the uprooted petty bourgeoisie brought fascism to power. Fascism is the creation of capitalism. Only the successful, independent action of the working class against capitalism is capable of eradicating the evil of fascism, along with its root causes. In this struggle the hesitant petty bourgeoisie will join forces with the revolutionary proletariat on the offensive, as the history of the great revolutions demonstrates. —Freedom of organization, assembly and the press! —Freedom of collective action and the immediate restoration of all the pre-1933 social gains! —Total elimination of all the fascist organizations! —Confiscation of their property for the benefit of the victims of fascism! —Conviction of all representatives of the fascist state by freely elected peoples courts! —Dissolution of the Wehrmacht and its replacement by workers militias! —Immediate free election of workers and peasants councils throughout all of Germany and a convocation of a general congress of these councils! —Preservation and extension of these councils, while utilizing all the parliamentary institutions of the bourgeoisie for revolutionary propaganda! —Expropriation of the banks, heavy industry and the large estates! —Control of production by the unions and the workers councils! —Not one man, not one penny for the war debts and the war reparations of the bourgeoisie! —For pan-German socialist revolution! Against a dismemberment of Germany! —Revolutionary fraternization with the proletarians of the occupying armies! —For a Germany of workers councils in a Europe of workers councils!